Photo provided by Cowlingweb and credited to Elaine Gott (nee Bracewell). "Mrs. Martha A. Freeman, who, with 56 years' service, the oldest woman servant of T. & M. Bairstow Ltd., presented Col. C. M. Bateman (Managing Director) with a silver cigarette box during yesterday's proceedings in connection with the centenary celebrations of the firm. A similar gift was also made to Col. N. B. Chaffers (Director). In the background (of similar photo) is a bronze plaque given by employees, which was unveiled by Mr. James Harrison, the firm's oldest workman, with 59 years service, and which is shortly to be placed on the wall of the mill. Today the workpeople were given a trip to the Empire Exchange in Glasgow. 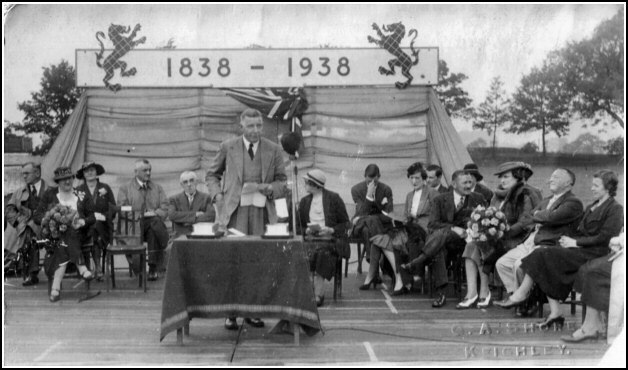 During the same week, a garden party was held at Lyndhurst, the home of Col. Bateman, for the Sutton & Eastburn Conservative Association." Barbara and Allen Chapman identified the location as Sutton Cricket Field. There's an interesting topic about this photo in the forum, you can read it here. The photo had previously been thought by some to have been taken at Cowling Rec and there's a discussion on the Cowlingweb message board which you can read here.